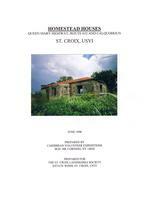 HOMESTEAD HOUSES, ST. CROIX Caribbean Volunteer Expeditions 6/98 are missing their shutters or lou vers. Around the exterior of the windows is a unique molding detailed in concrete. Condition There are major c r acks in most of the walls. The floor has been r emoved ; h ow ever, the roof is still remaining. The kitche n area is missing its shed roof. Route 632 House Plan. This house is again a rectangle, 14 feet wide by 26 feet long with two r ooms. There had also been a front porch, which is now partially collapsed. A k itchen 8 fee t by 6 feet is on the rear, with a door to an exterior p o r ch. Again there is an adjoining cistern, the top of which is about 3 feet from the grade. Again we see parts of a clo set shelf unit w hich formed the separat ion between the two rooms. Building M e t h ods and Materials. The walls of this ho use are parged either block or concrete. The roof is a gable, with 2 x 6 rafters sheat h ing boards, and corrugated metal. The floor is framed with 2 x 6 ra fters about 24 inches on center and 1 x 6 flooring. There are still wood window and door jambs and several shutters with a recessed panels. A series of qu oins at the corners as well as fretwork from th e front porch were decorative elements on this build i ng. Th e re is original electric w i ring and some original electric devices. Condition. The house is in poor condition, with major cracks in the walls The floor though remaining, is also i n poor condition Part of the roof on the northeast corner has pu lled up from the w alls. The front porch is collapsed, and the rear porch is in poor condition. Calquohoun House This house app ears to have been lived in rather recently, and therefore, changes and additions were made to the house. Plan This house has a more complicated shape Again we find the basic 14 foot wide rectangle about 39 feet long with three rooms in a row, plus a protruding front room. In front are a covered porch and a front door to the central room. In the rear is a 6 foot by 8 foot kitchen, and behind that a cistern Also in the rear i s an enclosed room, w h i c h probably was not original. The six foo t high closet shelf parti t ion is still quite intact in this house. The k i t ch e n again has a concrete shelf. HOMESTEAD HOUSES, ST. CROIX Caribbean Volunteer Expeditions 6/98 Electric The ho u s es all have evidence of an early electri c system Remnants of old wiring and fixtures remain. Condition The houses are all in very poor condition, with large cracks in the walls, and parts of the roofing missing. People had altered the houses over the years, including the addition of a room to the Route 632 house and changes to the windows, and doors.